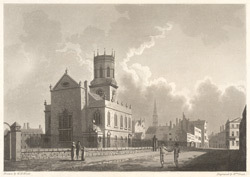 View of St Peter's Church in Liverpool, situated on the west side of Church Street. This was started in 1700 and consecrated in 1704. It was built in a similar style to that popularised by Christopher Wren in his London Churches. It has an unusual shaped tower and baroque style oval and round windows. The rooftop is decorated with classical style urns. The octangular tower, each angle has a pinnacle representing a candlestick and a guilt vane representing a flame. St Peter's Church was used as the first cathedral in the late 19th century, but was demolished in 1922.